this winter i have seen my skin look luminous thanks to all the beauty oil i have slathered on it, spotty thanks to overindulgence in baked yummies, and new in a dry patch on my forehead. this by far is my favorite look. it is itchy and because i am constantly scratching it now has a cute spot right in the center of it. because my skin is so sensitive, i don't exfoliate it and just use masks as needed. but this spot, it just won't go away no matter how much oil i put on it. i came across these new face scrubs/masks from St. Ives. 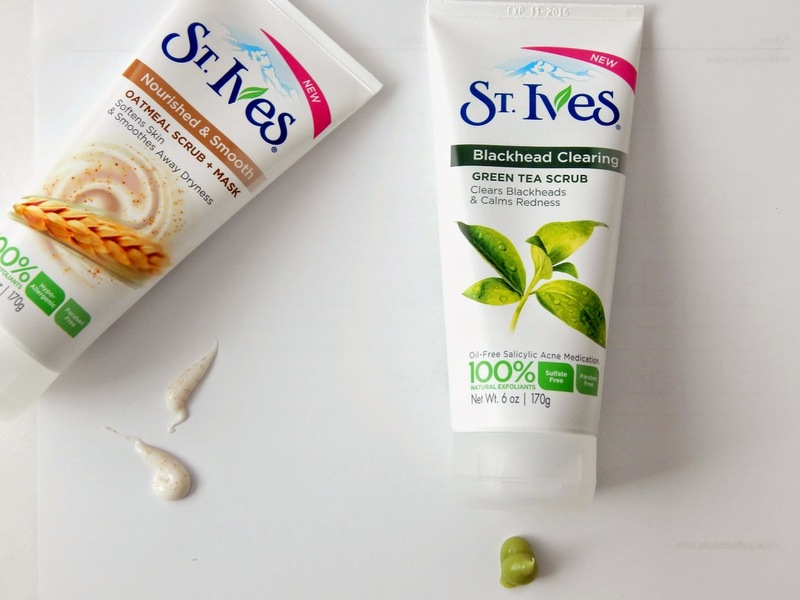 nothing says soothing and hydrating like St. Ives. i quickly popped the Green Tea Blackhead Clearing Scrub (because anything with green tea in it makes my face happy) and the Oatmeal Scrub + Mask which as the name clearly states is a 2 in 1 product. both are oil free and very gentle on the face. they have 100% natural exfoliates, sulfate free, hypoallergenic, and paraben free. i used the oatmeal as a mask first and then used warm water to work it into a lather and scrubbed my forehead. i then went in with the green tea scrub on my nose. my face was not irritated at all and still felt hydrated. the dry patch was noticeably calmer. they do have a delicious scent to them and i was worried about that but i am assuming they smell naturally of their ingredients. give these a go and let me know what you think @lifeinmascara.